California Coastal Commission approves outdoor concert project, to be located next to Marriott Marquis Marina. SAN FRANCISCO — San Diego’s downtown embarcadero, which is home to a sizable recreational boating community, will soon home to a permanent outdoor concert venue. The concert venue would replace a temporary structure at Embarcadero Marina Park South, which is located in between Fifth Avenue Marina and Marriott Marquis Marina. Embarcadero Marina Park South had been used for San Diego Symphony summer concerts, known as Bayside Summer Nights (previously Summer Pops). Such concerts would occur more frequently once the permanent concert venue, known as Bayside Performance Park, is finally online. San Diego Symphony regularly applied to have a music festival-type stage built and removed at Embarcadero Marina Park South, just for the Bayside Summer Nights series. 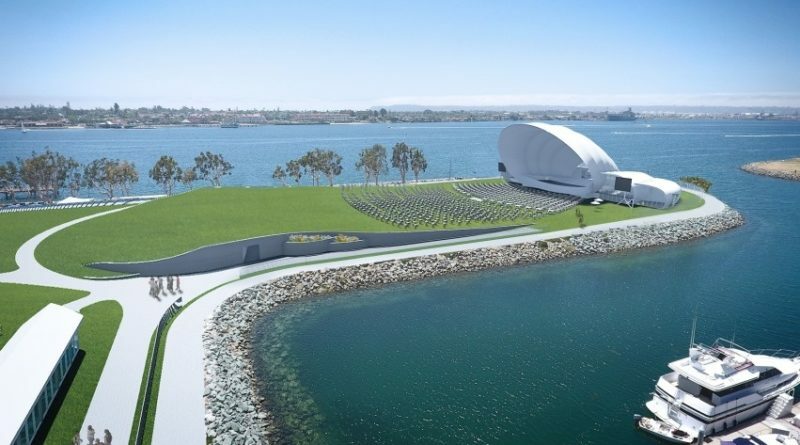 The new, permanent outdoor concert space would feature a 57-foot acoustic shell housing a stage, turf lawn with temporary seating, a box office and two food pavilions. Port of San Diego Commissioner Marshall Merrifield addressed the Coastal Commission shortly after state agency’s formal presentation. He boasted the project’s artistic and cultural contributions to the San Diego waterfront. Also speaking to the Coastal Commission were San Diego Symphony CEO Martha Gilmer and Port of San Diego CEO Randa Coniglio. Access and environmental responsibility are two priorities for the permanent performance park, Gilmer told coastal commissioners. The project’s price tag is pegged at $45 million, with $6 million already raised. Gilmer has been out raising funds to pay for the permanent concert venue. A temporary concert venue exists where the port district hopes to erect the permanent symphony stage at the marina-adjacent public space. San Diego Symphony had operated a temporary stage at the open space since 2004. As many as 5,200 people could attend any of the outdoor performance events. Seating capacity for the new, permanent outdoor venue would nearly double to 10,000 people. Events would increase from 37 currently to 110 half-day or 55 full-day events. The venue must be open to the public 85 percent of the year. Plans also call for an expanded promenade, which would be open to the public at all times. “I think, in the end, [this project] will enhance and diversify, frankly, the access and public experience that occurs at this particular location,” Coastal Commission member Steve Padilla said. The U.S. Army Corps of Engineers as part of a dredging project built Embarcadero Marina Park South in 1978. The dredging project created two peninsulas: Embarcadero Marina Park South and Embarcadero Marina Park North.